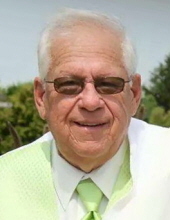 Celebrating the life of Larry G. Fankhauser, Sr.
Obituary for Larry G. Fankhauser, Sr.
Larry G. Fankhauser, Sr., 74, of Waterloo, died Wednesday, December 5, at Covenant Medical Center. He was born September 22, 1944 in Waterloo, son of Henry and Vivian Wroe Fankhauser. He married Mary Fehlandt on July 10, 1976 in Waterloo. Larry was employed with Chamberlain Manufacturing Company for 27 years and later with Ravenwood Nursing & Rehab Center for 13 years, retiring in 2006. Survivors include: his wife; his children, Larry (Loretta) Fankhauser, Jr., John Fankhauser, Jody (Robin) Fankhauser, Debbie (Ralph Carson) Miller, Michael (Luanne) Fankhauser, Jamie (Kyle Mundfrom) Brown and Scott (Kim) Fankhauser, all of Waterloo; an adopted granddaughter, Caden Fankhauser of Waterloo; a nephew, John Bender of Exeland, Wisconsin; a niece, Carrie Bender of Waterloo; a brother, Timmy (Jennifer) Fankhauser of Waterloo; three sisters, Carolyn Fankhauser and Sandra Seeman, both of Waterloo and Barbara Jungen of Elk Run Heights; and special friends, Jim and Vivian Brookman and family of Waterloo. Preceded in death by: his parents; a grandson; and two brothers, Donny and Jimmy Fankhauser. A memorial service will be 2:00 p.m. Saturday at Hagarty-Waychoff-Grarup Funeral Service on West Ridgeway with entombment in the Garden of Memories Columbarium, where full military rites will be conducted by American Legion Post 138, Veteran of Foreign Wars Post 1623 and the Iowa Army Honor Guard.. Visitation will be from 4 to 7 p.m. Friday at the funeral home. Memorials may be directed to Cedar Valley Hospice or Covenant Medical Center. Larry was a phenomenal human being. He had so much love in his heart for everyone around him. His greatest pride and joy were his children, grandkids and his fishing poles. If you couldn’t find him, he was probably out fishing or tinkering in his shed. Larry will be missed by many and never forgotten. To send flowers or a remembrance gift to the family of Larry G. Fankhauser, Sr., please visit our Tribute Store. "Email Address" would like to share the life celebration of Larry G. Fankhauser, Sr.. Click on the "link" to go to share a favorite memory or leave a condolence message for the family.